Submitted 1 year 9 months ago by undone. 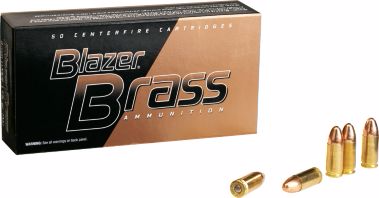 CCI® Blazer® Brass Handgun Ammunition Affordable and reliable handgun ammo Clean-burning propellants reduce fouling Great for practice, target shooting and training CCI Blazer Brass Handgun Ammunition is loaded in reloadable brass cases for reliable performance and increased value. Primers ensure reliable ignition and load clean-burning propellants that reduce fouling. Great for practice, target shooting and training exercises. Per 50.